In 1970, I was just getting into rock and roll. Up to that point, my idea of cool music was limited to anything Elvis Presley had come out with to that point. However, I hung out with a friend that turned me on to playing the guitar and broadened my interest in musical taste beyond just Elvis. He turned me on to Jimi Hendrix, Iron Butterfly, Simon and Garfunkel, and Janis Joplin. Elvis is dead, as are Darryl DeLoach and Erik Braunn of Iron Butterfly. Paul and Art are still around but Jimi died in 1970 and Janis died 16 days later. As a punk of a teenager in the 70's, I devoured all the books that were available at the time on Jimi and Janis. The prevailing book on Janis, at the time, was the 1974 book by one of her lovers, Peggy Caserta. It was definitely a tell-all book that fueled many more legends about the bluesy siren of the 60's. Several of my classmates passed the book around so that we could all read about her life and untimely death. Fast forward, oh, about 35 years. Imagine my thrill and excitement in sitting across the table from none other than Sam Andrew, one of the founding members of Big Brother and the Holding Company. 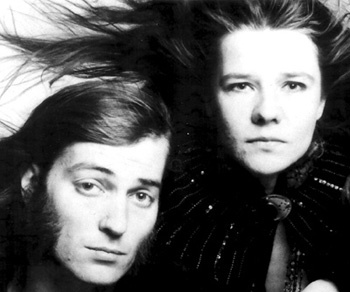 BBHC was an already successful San Francisco area band who gave Janis Joplin the opportunity to join them as their vocalist. As they say, the rest is rock and roll history. I sat down with Sam on the patio of a quaint little café in a little village outside of San Rafael, California. It was there, with the beautiful scenery and sounds of the Roys Redwood Preserve as a backdrop, that our chat took place. One might expect that, with the reputation of Janis Joplin, that those who were around her that are still alive would be burned out hippies. This is not the case with Sam Andrew. He is a well educated, multi-talented man who can hold a conversation on a wide variety of subjects. He studied linguistics and etymology at UC Berkley. He's an established painter. In addition to rock, he listens to a wide range of classical composers with his lovely wife, Elise, who is an accomplished classical pianist. Andrew comes across as a man who is more than comfortable with who he was as well as who he is. It is obvious that he is not prone to dwell on what could have been. He lives for today and is professionally occupied on a variety of projects. Starting off the conversation with Sam, I go to the obvious subject: Janis. Many biographers and journalists have covered her art, lovers, drinking and drugs to the point of distortion. Not wanting to repeat questions that Andrew has probably heard countless times in the 39 years since Janis' death, I ask him what is the one thing that is not understood or realized about Janis. He's quick to respond, often referring to her in the present tense. "The first answer is that she was an intellectual. She was really widely read, which, in the 60's was something because it was, basically, a non-verbal time. So she'd read all this stuff. She read all the way through that. She read Nancy Mitford on Zelda Fitzgerald, for example. She read one book after another the entire time I knew her. Janis was well informed and well spoken, very bright with a large vocabulary. Now, I don't know if people may know that. I think, usually, Janis is thought of as a rather cartoonish, blues belter hot mama type of character. And she definitely was that but there was this other side that added to the picture, that wasn't in conflict at all with who she was. She was very colorful and picturesque. She was just funny to be around. She was as funny as Phyllis Diller or Joan Rivers, and very much in the same way." I mention to Sam that, in the Joplin biography, Pearl, it briefly mentions that, while on tour, she would bring along a box of books on philosophy and religion. Building on that comment, he continues, "You know, it's probably not that uncommon. I was talking to Patricia Kennealy-Morrison, who was the Doors' Jim Morrison's girlfriend whom he bonded with in a pagan ceremony. She used the phrase "Homer nodded," which is a very old academic phrase meaning that anyone can make a mistake, even Homer, the father of literature. So I asked her where she was educated and what books she read. In answering this, she mentioned that Jim Morrison always had three or four books going, just as Janis did. So, maybe it was more common than we think. "The 60's were such a non-verbal era. I went through a thing when I couldn't read fiction because it called for too much of a suspension of disbelief. I could feel the person writing the story, you know what I mean? So, I couldn't get into the story. The writer didn't disappear. The writer was always there, choosing this word or that word, writing that paragraph. So, I only read non-fiction for a long time – maybe at least ten years, maybe more. I read a lot of nonfiction, including several classic histories of England and, for example, Boswell's Life of Johnson, probably the best biography in English, several times." Because of a natural inclination, and because of his formal education in linguitics, he is fascinated with words, reads the Oxford English Dictionary for amusement and reads about various languages and the roots of words in all the Indo-European languages and Japanese." Sam makes it perfectly clear that Joplin is much more multi-dimensional than one might imagine. He describes her as having "a mind that probably came from her mother. She had a kind of a cold, calculating school teacher side to her. That's something that people wouldn't think of at all. All the while, this other character is there and there's this intellectual there, a school teacher. Janis was the one who described an LSD experience as an "altering of the spatial temporal relationships." Not many celebrants would have put it that way." I say to Sam, "Everything you read about her and others who died like her, Elvis and Hendrix, they always want to focus on the sadness in their life. Was it that bad?" His answer does, and does not, surprise me. "No, no, it wasn't at all. I would almost TOTALLY deny that. On the other hand, I'm not a lot for psychological investigation of someone being sad. But, no, she was having a good time. She had WAY more fun than you and I put together, probably. She just had a real good time. And, when she actually died, she had a good time all the time. But, then, everything was on the ascendant. She was making this album. She's getting along with her band. She's going to record the vocal on "Bobby McGee" the very next day. She was gonna marry this guy (fiancé, Seth Morgan), a totally wrong guy but that's another story." It's very clear that Andrew didn't think much of Morgan on several levels. He seems especially disgusted with the circumstances surrounding Morgan's own death. "He killed a woman. He took a woman with him on the motorcycle. She said, "No, no, I don't want to go!" And, he said, "Yes! Yes!" He forced her to go and he killed both of them. Probably not a person you would want your daughter to be with. " The one positive trait about Seth Morgan that Janis mentioned, Sam says, was that "he could pay for a meal and drinks and Janis really liked that." He concluded by adding that it was a rare thing in her life to have someone around her who could not only pay his way, but hers as well. I asked if it was true that she was frugal with money, he replies, "Yes, she had that side. That was part of that school-teacher thing. She was very meticulous, even fastidious about her accounts. Kept records of how much she'd spend. Everyone's real surprised by that when she died and they found her records of outgo and income. So there was this calculating side to her that comes out. "You know, there's a play called, Love, Janis? In that play, from the very beginning, when she comes to join Big Brother, she's calculating about success in a way that none of us were. We were all riding this thing, playing this music, and really happy about it. And I thought the whole thing was going to last, maybe, two years or something like that, at the outset, and never be heard of again. "But she wanted to be a star like Cher someone. This was a very strong thing to her. She had this image of success in everything she did. Like, she bought the clothes – that gold lame' outfit she wore at Monterey Pop. She was very career conscious, like, 'I want to dress like a star. I don't want to dress like everyone else.'" "The rest of us were like, 'We want to be genuine. We want to dress like our audience, you know?' You stand up on stage and you look out at the audience and if they look different from you, there's a disconnect. But, you know, she was all for that artifice. And, in retrospect, I admire her for it. She had a very clear picture of success. That's what you're supposed to do when you're going for a goal – have this concrete image of it. She really had that. The rest of us were kind of bumbling along, 'Hey, this is great! We're playing!' . . . whereas, what she was doing was sort of old fashion, in a way of striving for success, a very clear, concrete goal of success." At one point during our conversation, the subject of Janis' estate comes up – a delicate subject to some of those who knew her. However, Andrew, ever the gentleman, discusses the matter honestly and objectively. "Our relationship with the Estate has evolved over the years. Laura and Michael (Janis' brother and sister) were children when we made it, you know? They weren't there when we did what we did to succeed. That was the main problem when they came to grips with details of Janis' life. They inherited the estate when their mother died. "At first, they blamed us for her death. (Quoting Joplin's family), 'Janis would not have done heroin if she had not met you.' And, 'You were awful to her. You ruined her. You've taken this person from our family. NOW, you say you have something to do with this music and you want some of these royalties. She deserves it all. She was the one who made the money, and you shouldn't get anything. You didn't have anything to do with Janis becoming a success. We're not going to give you any money, and we're not going to give you any say in what goes on with your own recorded music, and anything you want, we're against it.'" "For years it was that way. The Estate released many albums where we had no say at all in what went on the album, what cover art was used, how the songs were treated. Los Angeles session musicians were actually used on at least one album, so there is a falsification of history going on here too. I mean, do you want to hear Billie Holliday with a lot of musicians who are 'better' and who are added on later, or do you want to hear her in the environment where she really recorded the tunes? I suppose it's an open question, but I will always go for the original version, no matter how badly everyone played or didn't play. "And, there is a rerelease of Cheap Thrills in the works right now at SONY and, do we get to hear about that? No! We have to read it in the trade publications. That's outrageous. Anyway you cut it, Cheap Thrills is a Big Brother and the Holding Company album. I personally put a lot into making that album what it was, and I know we all did. Not even to be notified when this album is up for rerelease is insulting and unethical. Do I think Michael and Laura are at the bottom of this? No, but I don't think they're overly worried about it either, and they never have been. "Anyway, after this initial phase of distrust from the Estate, Laura Joplin wrote a book called, Love, Janis and, to do that book, she had to interview everyone in San Francisco. And she began to understand. She said, 'Oh! Everybody was doing drugs. Not just Janis. Big Brother wasn't in this dark room, exposing Janis to heroin.' If anything, it was the other way around. Everybody was doing this and so Laura's understanding expands a little bit. And then Randal Myler wrote a play based on her book and so Laura had actually to hang out with many real people who knew Janis. And she slowly came to an understanding of who Janis was and of the fact that everyone is responsible for herself – that Janis is the one who is responsible for being a drug addict.